Cape Town - Proteas seamer Rory Kleinveldt knows he will probably be dropped for South Africa's next Test against Pakistan. Kleinveldt played his third Test in the Proteas' innings and 193-run win over New Zealand in Port Elizabeth over the weekend, and returned match figures of four for 97 over two innings. It is a marked improvement since a horror debut against Australia late last year, when he was clobbered for 97 runs without taking a wicket as the Aussies amassed 565 for five in Brisbane. 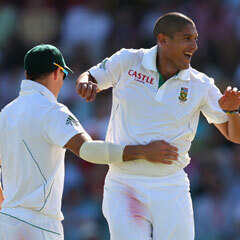 He fared better in his second Test, in Perth, returning figures of four for 146 as the Proteas claimed a series win. However, he only got back into the side due to a hamstring injury to his Cape Cobras team-mate, Vernon Philander, and Kleinveldt expects to again be left out for the first Test against Pakistan at the Wanderers, which starts on February 1. "I'm realistic about my role in the team and that Vernon probably will take my place as soon as he's fit," he told the Beeld website. "All that I can do is to keep on working on my bowling and to remain fit. Hopefully I've done enough to ensure the selectors won't totally forget about me." The Proteas play a three-match ODI series against New Zelaand, starting in Paarl on Saturday, before the Pakistanis arrive for three Tests, two Twenty20s and five ODIs. AB de Villiers (Titans, captain), Hashim Amla (Dolphins), Farhaan Behardien (Titans), Quinton de Kock (Highveld Lions), Faf du Plessis (Titans), Colin Ingram (Warriors), Rory Kleinveldt (Cape Cobras), Ryan McLaren (Knights), Morne Morkel (Titans), Robin Peterson (Cape Cobras), Aaron Phangiso (Highveld Lions), Graeme Smith (Cape Cobras), Dale Steyn (Cape Cobras), Lonwabo Tsotsobe (Dolphins). HAVE YOUR SAY: Should Rory Kleinveldt retain his place in the Proteas Test team for the Pakistan series? Or is there just no open spot for him once Vernon Philander is fit? Send your thoughts to Sport24.